The field is initially set as [Unspecified] and you can select one of the cargo types available. When Bulk, Break Bulk, Air Freight and Charter is selected as the Cargo Type, the container number fields gets disabled. 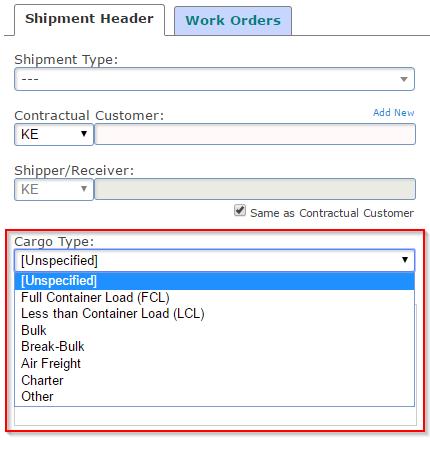 The Cargo Type field is not mandatory by default, but it can be made mandatory for specific corridors by selecting the field in the Corridor Definitions > Mandatory Header Fields section. The field is available for export in all Reports. It can also be added to any forms if required. With the latest update of TrakIT, you can now auto-generate Bill of Lading numbers (Transport Documents) with pseudo-random alpha-numeric text. These numbers are unique and non-sequential. When this option is selected, the T/D number is generated automatically on the Create New Shipments page. If the number is not suitable (for any reason), click on the "Re-generate" link to generate a new one. Each number is 10 characters long.